Greg Carmichael: We've got a selection of material for you tonight. Miles Gilderdale: Good. That's better than playing the same song all night. In the mid-1980s, I spent a few years working the overnight shift for a "smooth jazz" radio network, and coming from a personal background of alternative music, I found the catalog of (to me) unknown artists for this relatively new format to be pretty dang exciting. While performers like Larry Carlton, David Benoit and Sadao Watanabe were firmly established artists in their circles, they were new to me, and I quickly immersed myself in a whole new pool of musicians I had never heard. In 1987, British-based Acoustic Alchemy, formed by Greg Carmichael and Nick Webb, released their first CD, Red Dust & Spanish Lace, and quickly joined the ranks of the popular core artists like Benoit and Watanabe for the burgeoning "smooth jazz" format, with their mixed bag jazz, pop, Latin blend of nylon string and steel string guitar instrumentals. 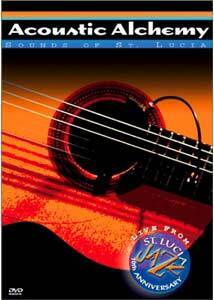 Acoustic Alchemy: Sounds of St. Lucia, was recorded in 2000 at a small outdoor venue in (surprise) St. Lucia, for The Jazz Channel, during the band's tour to support their Beautiful Game CD. Co-founder Nick Webb succumbed to pancreatic cancer in 1998, and while his death left an obvious hole, guitarist Miles Gilderdale (who joined the band for 1998's Positive Thinking release) has stepped up admirably to the unenviable role of filling Webb's shoes. Though Acoustic Alchemy has modified and expanded their sound slightly over the years, their music has remained largely consistent, and more importantly, familiar; this performance showcases a mix of early material, as well as newer titles. The camera work on this disc is all about the musicians, with plenty of tight close-ups on intricate fret work, and when bassist Frank Felix is thumping through his intro on Panama Cat it becomes a veritable primer on how to play. Admittedly, the band may not be particularly exciting to watch perform, but the music they make is more than hip and groovy enough to make up for it. Image Transfer Review: The 1.33:1 full-frame transfer is presented with an array of bright, vivid colors (check out the bright multi-colored backdrop on the stage), and though their lighting is relatively staid, there is never any distracting bloom or bleed. Image detail is a little soft at times, but overall the clarity, especially on those guitar closeups, is quite crisp. No noticeable nicks, scratches or otherwise. Audio Transfer Review: Image has been consistently releasing exceptional audio transfers of concert discs, and this one is certainly in league with past titles. Presented in Dolby Digital 5.1, DTS and 2.0 surround, the audio options are all solid in their own right, though the DTS track once again merits top honors for its deeper, fuller, more resonant presence. Even the 2.0 track, which often becomes the red-headed stepchild of audio transfers, is remarkably full. Another fine job from Image. Extras Review: Oddly enough there are no discographies or biographies here, but there is an interview (09m:55s) with band frontmen Greg Carmichael and Miles Gilderdale. The segment is split into different sections (Band Description, Changes, Beginnings, etc) by title cards, and Carmichael and Gilderdale expound briefly on their perceptions about the band, as well as how they achieved success in the States years before they did in their home country of England. The two don't seem particularly comfortable as interview subjects, but their lack of the usual boisterous self-congratulating pomp that comes from most musician interviews is a welcome change. Also included is a television commercial (:30s) touting tourism to St. Lucia. The disc is cut into 14 chapters (one per song). Another impressive audio transfer from Image helps turns Acoustic Alchemy: Sounds of St. Lucia into, if nothing else, a real joy to listen to. Oh yeah, the band is excellent, too.